Hey hey Diva friends! Let's talk about soup and gut health....sounds good right? What is easier than indulging in some delicious soup in this cold weather? 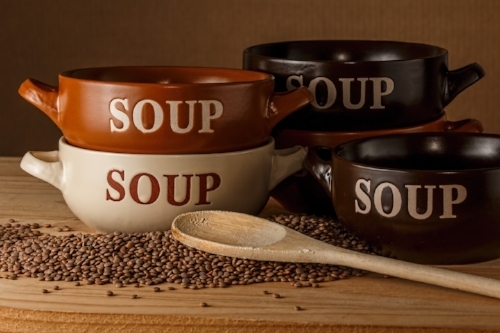 Soup certainly doesn’t sound like any special life changing superfood. It’s soup, you’ve eaten it all your life. Yet soup has massive potential that often gets hidden behind nasty preservatives and less than ideal flavoring agents. The true beauty and nourishment happens with whole food ingredients and high quality homemade bone broth. Place all ingredients in the crockpot, fill it up with water (purified!) and let it simmer for 24-48 hours. Use this as the broth base for any soup recipe, or simply enjoy a warm cup like coffee. 1-2x/day. Note* let your broth cool after you have strained it (not TOO long as bacteria will grow quickly) and scoop off the fat layer that settles on top. The more fat the more healthy collagen is in your broth! Keep frozen or in the fridge for up to 5 days. If my broth is in the fridge 5-6 days or longer I simply make sure to boil it again before drinking. Go to your local farmer’s market and get the freshest seasonal produce you can find. In the summer you may enjoy fresh garlic, beets and carrot in a homemade stock and blending with fresh dill. Served cold on a hot day with a drizzle of plain yogurt, this soup is refreshingly tangy and packed with nutrients. Add all ingredients to your blender and process until super smooth. Enjoy!! If you’re seriously interested in getting healthy, restoring your digestion and boosting your energy then check out my new comprehensive program Get Gutsy With Me launching January 15th, 2018! In the program you get a ton of delicious satisfying recipes as well as strategies that will help rebuild your intestinal flora. Share YOUR favorite soup below!